I am really excited about this new series I have started, for a couple reasons. 1. It’s whimsical, fun, and lighthearted. Sometimes that is just the break I need from the art ideas swirling in my head, that look a certain way, and never seem to turn out how I want (at least as of lately). 2. 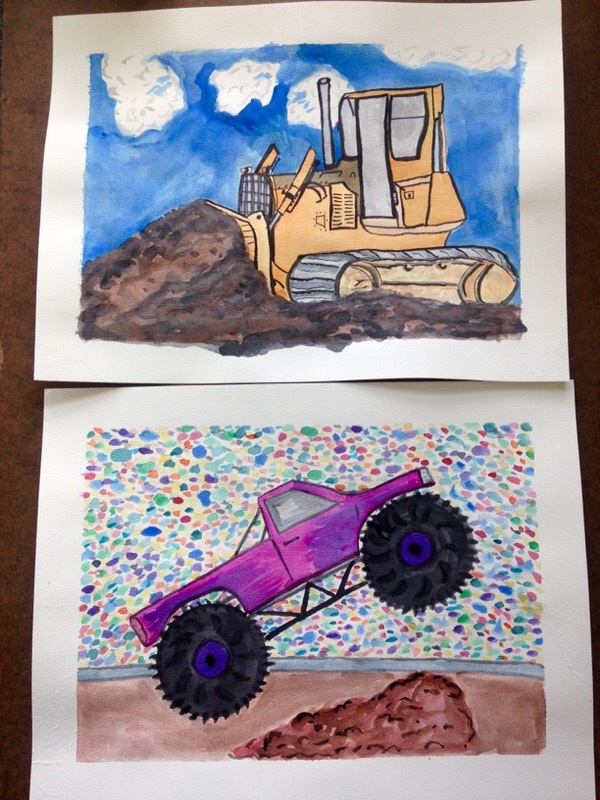 My kids are really excited because it is based on the things they enjoy – machines with wheels. Nothing makes me smile more than their sheer joy. More to come soon. 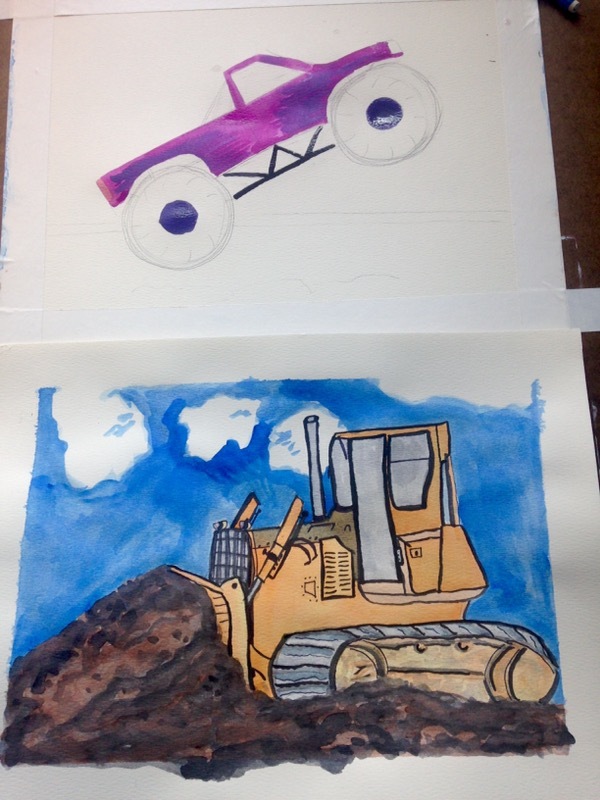 Maybe a back hoe or a crane next?? This is another recipe that I concocted based on items I had in my kitchen, I did not go out and buy any of these things with this recipe in my mind. This is my favorite kind of cooking – I feel it’s a direct extension from my collage and painting mindset. My ah-ha moment of making quiches came about when I finally figured out to fill my favorite pie pan with water and then pour it into my stainless steel bowl that is marked with measurements. 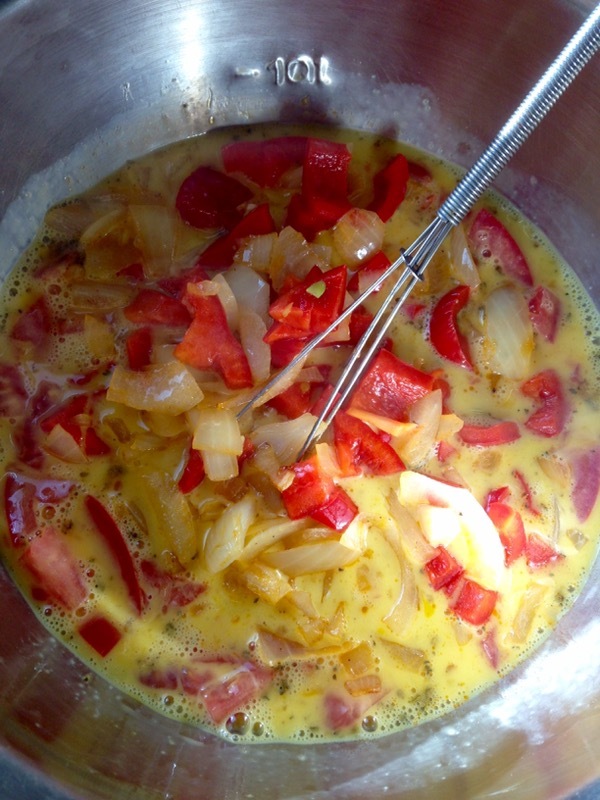 Now, aside from a few basics I keep the same – 4-5 eggs and 1 cup of liquid – I can mix and match my quiche recipes as I like. The 1 quart line is the magic line to keep my quiche from overflowing. 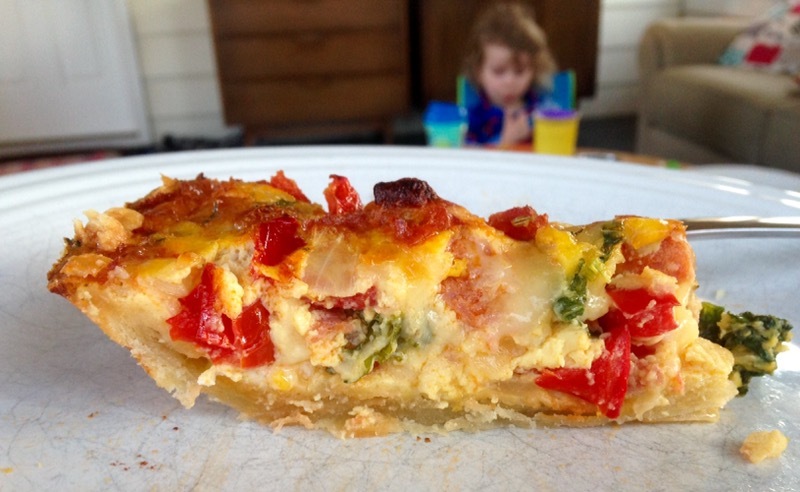 Pizza quiche should be whatever pizza toppings are your favorite – we went with pepperoni, tomato, red bell pepper, kale, onion, and cheese. For more on crust techniques and tricks of the trade check out previous links on pastry crusts. I first learned about the vodka crust technique from my dad, who learned about through reading about J. Kenji Lopez-Alt’s findings, author of The Food Lab, for America’s Test Kitchen. You can read more about it here. I can’t wait until that kale is coming out of my yard again. It was so nice earlier this week – at 71° – that we ate dinner on our porch. Today it was supposed to snow, guess that is just spring in Iowa for you. My daughter is in the background of this photo making her *lovely* gagging-because-you-made-me-try-a-new-food face. Even though it is just eggs and pizza toppings, both of which she loves. Sigh. Toddler adventures with food. Meanwhile, sauté 1/2 yellow onion, diced with 1 small red bell pepper, diced with seeds and ribs removed in 2 tablespoons olive oil over medium-high heat until softened. 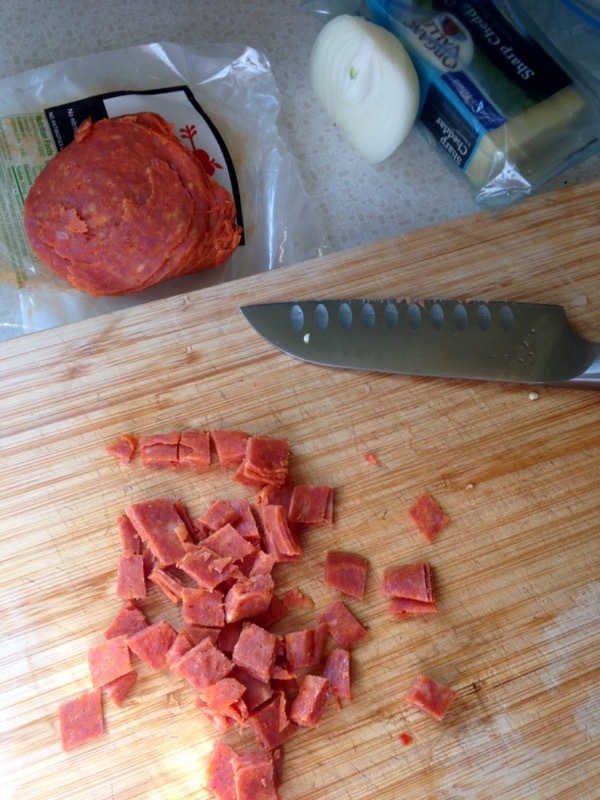 Combine in a bowl: 5 beaten eggs, 1 cup milk, 1 medium tomato, diced, 3-4 oz of chopped pepperoni, 1-2 tablespoons of pizza seasoning, 1 cup shredded cheddar cheese. 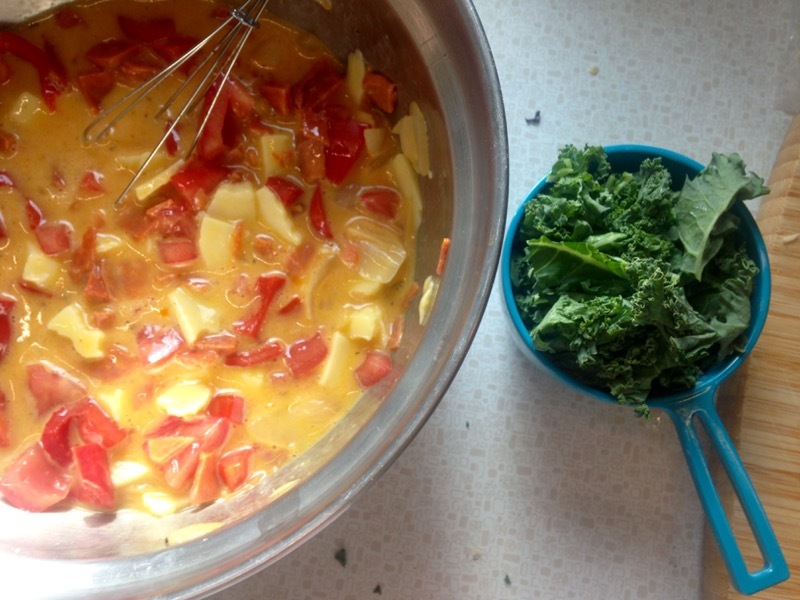 Mix in the onion mixture and 1 cup of shredded kale. Pour into prepared crust and bake at 325° for 50-55 minutes or till the center jiggles slightly and is almost set, or when a knife inserted near the center comes out clean. If necessary, cover the edges in foil or with a pie crust shield, to prevent browning in last 20 minutes, or so, of baking. 1. Using a pastry blender, cut in 1/3 cup butter into 1-1/4 cups flour. Pieces should be pea-sized. Sprinkle 1 tablespoon of ice-cold water over part of the flour mixture; toss with a fork. 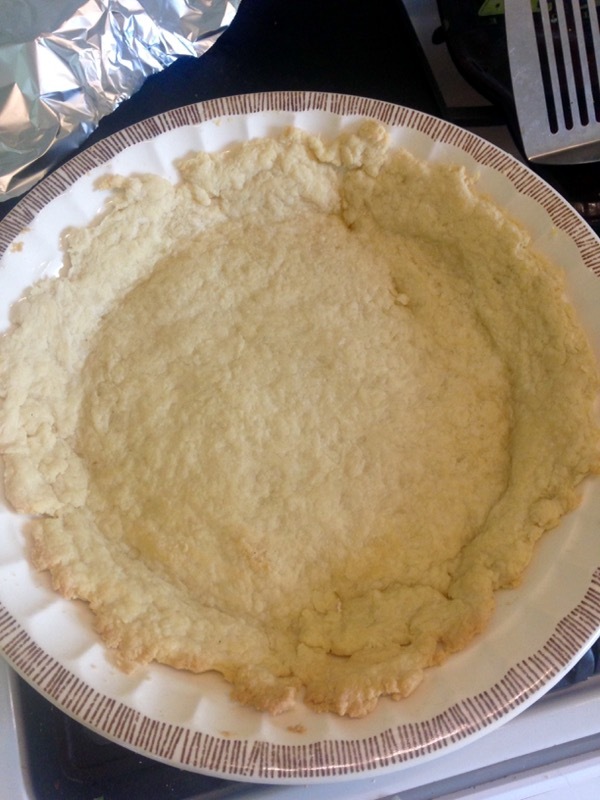 Push moistened flour to one side of the bowl. Repeat, using 1 tablespoon of the liquid at a time until all the flour is moistened, using 4-5 tablespoons of ice-cold liquid – water, vodka, or a mixture of the two – in all. Form dough into a ball. 2. On a lightly floured board, use hands to slightly flatten dough. Roll dough from center to edges into a circle about 12 inches in diameter. 3. To transfer pastry, wrap dough around a rolling pin. Unroll into a 9-inch pie plate. Do not stretch the dough, as this will cause shrinking. Trim excess dough and fold over. Do not prick dough. 4. Line with double thickness of aluminum foil. Bake in a 450° oven for 8 minutes. Remove foil, bake for 4 to 5 more minutes or until pastry is set and dry. Reduce oven temperature to 325°. Eric made this lovely dice set a while back (as in, December!) and I forgot to post them until now. It was a simple project – cut a long piece of wood into a set of five cubes, sand, and then use a Wood Burner to make dots on the die. They could be a fun addition to a kids’ block collection, a larger than life set of die for backyard or game night fun, or a great learning set for young, budding Yahtzee enthusiasts. In any case, we gave them away to my sister and her husband. Now I just need Eric to make me a set for summer die games on the porch. Speaking of the porch, we are getting closer to being done with that project. Here’s a peek – we redid the floors, insulated the walls below the windows, and added white bead board under the windows. We also upgraded to some more comfortable furniture. Eric scored these orange (!) office chairs at a furniture thrift shop. He knows me and my affinity for orange and chairs, so well. We started this porch process last summer and hope to finish it this spring before it gets too far into porch season. More on the porch project in the near future. I love making a meal completely out of fresh produce from our weekly Door to Door Organics box and a mish-mash of items in the pantry and fridge. My husband has turned me into a use-it-up junkie – I am now always trying to find creative ways to use the last three lasagne noodles, 1/4 cup of rice, or the last taco shell. This is one of those recipes – blissful layers of roasted potatoes and onions, smoky tomatoes with taco seasoning, sprinkles of cheese, and a crunchy layer of taco shells on top. Start by roasting potatoes and onions until soft and lightly browned. I used a Cast Iron 12″ Skillet (I also have the lid for this skillet – completely worth it! ), got it hot on the stove first, then cooked the mixture in the oven until done. Use whatever you have on hand, or cater to your personal preferences, to make your taco sauce layer. I used a 1/2 bag of meatless crumbles, 1 large can of fire roasted tomatoes, and a packet of spicy taco seasoning. When it all simmered together for 10-15 minutes, it thickened up nicely. I did cut up the whole fire roasted tomatoes to make them more bite-sized. Create layers in the order of your choice. My layers were: sauce, tortillas, potato mixture, sauce, tortillas, potato mixture, crushed taco shells, grated cheddar cheese. I have found that no matter what order my layers go in for Mexican casserole, it always falls apart, so no worries on amounts and order of layers. I served my casserole two different ways – with a cooked brown and wild rice mixture, avocados, and red peppers (see top photo) and with chopped cabbage and avocado the second time (see photo above). Both meals were delicious and I am happy to report my youngest loved this meal. My oldest took a little cajoling to try a bite that was followed by a scrunched up face. However, she does that to anything new right now. Peel and chop 5 medium yellow or red potatoes. Peel and mince 2 garlic cloves. Dice 1 medium yellow onion. Combine together in pan and roast at 375° for 25-30 minutes or till softened and slightly browned, stirring once in the middle. In a large skillet combine: 1-28 oz can of fire roasted tomatoes, 6-12 oz meat or meat substitute of your choice, and 1 packet of taco seasoning. Simmer on low until thickened and bubbly, about 10-15 minutes. In a 9×13 pan, spread 1/2 the sauce on the bottom. Then place a layer of torn and whole corn tortillas with half the potato mixture on top. Spread the remaining sauce, another layer of tortillas, the last of the potato mixture and top with crushed taco shells and a grating of cheddar cheese. Bake in a 350° oven for 20-25 minutes. Serve with taco toppings of your choice.